Ballymore's winning run continued at Geelong on Wednesday with the talented Yesterday's Songs recording a dominant first up victory. Having his first run since September, the four-year-old has always shown plenty of ability winning two of his first four starts but a couple of set-backs has seen him remain lightly raced. "He has always been a very promising horse," Michael Moroney said, "but he has been a slow maturer and a few things have gone wrong for him." "He was actually ready to resume about six weeks ago but he hurt himself after a jump-out which put him back a bit." But all was good on Wednesday with Yesterday's Songs overcoming a tardy start to record his third win from just six starts. Getting back and covering a bit of ground, Yesterday's Songs swung widest into the straight as the leader kicked clear. But he was soon chasing and after hitting the lead close to home he was able to draw clear by an impressive 2 3/4 lengths. "Hopefully we can get him to some decent races now," Moroney said, confident that he can find a race or two over the Adelaide and Brisbane carnivals. Meanwhile we take Serenade to Randwick on Saturday, looking forward to seeing how the talented filly shapes up after her excellent run in the Golden Slipper. Pulling up well from her 2.1 length seventh, Serenade tackles the Gr.3 Percy Sykes Stakes - due to jump from the inside gate for Craig Williams. 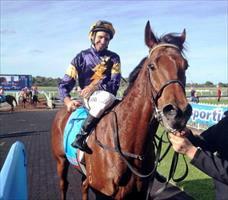 "The only query is that she has been up a while but she has trained on and she is a pretty tough filly," said Moroney. We have two runners in Bendigo's feature on Saturday, the Elmore Cup. Whilst Mister Impatience is likely to find the mile a bit short, Habitual Offender will relish the trip after a solid first up performance over 1300m. "He ran a really nice first up and he is a horse who can go through his classes this time in," Moroney said of the Guillotine four-year-old. Sunday is a quiet day with just the one runner, The Hotz heading to Kyneton where he looks nicely placed stepping up to 1850m. "He ran a much improved race second up and our only worry is the tricky gate - but so long as he gets across okay he will prove hard to beat."